Classrooms and conference rooms, particularly those that need high brightness and an ultra short throw. Physical attributes. With the projector on a table and viewed from behind, all connectors are on the left side panel in a recessed area. The focus slider is above the connection panel, midway between the front and back. The power connector and intake vent are also on the left side, between the connectors and the back, with additional intake vents on the front and exhaust vents on the right side. The window that serves as a lens is on the top, in a recessed area near the rear, and slightly below the top surface. The security bar and Kensington lock slot are on the front. The speaker is at the rear, facing towards the audience. The Casio XJ-UT311WN test unit measured slightly higher than its 3,100 lumen rating. Note that it has an unusual approach to setting brightness. The first two rows in the ANSI lumens chart that follows are with the Light Control setting Off, which allows only two options, Bright and Normal. The remaining rows show the ANSI lumens for each color mode--which are available only with Light Control On. Also included are measurements for the least and greatest Eco levels. There are four additional Eco levels that are not included in the chart. Eco mode. With Light Control On, the XJ-UT311WN offers 7 settings for Light Output, ranging from 7 for full power, to 1 for the greatest Eco level. Using full power as the point of comparison, each step from 7 to 1 reduces power by roughly 6% to 7.4% as follows. Keep in mind that compared with Bright mode's 3,125 lumens, even the highest power setting of 7 reduces brightness. Standard for example--the brightest color mode--reduces brightness at full power by about 25% compared to Bright mode. So the 40% reduction in brightness at level 1 is 40% lower than the maximum for Standard mode, not the maximum with Light Control Off. Brightness uniformity. The brightness uniformity for the test unit was 71%, a high score for a UST projector. As is typical for UST models, the image is brightest towards at the center bottom, closest to the lens, and dimmest at the upper left and right corners, farthest from the lens. The drop in brightness is just enough to see on a solid white or light-colored screen. It is not visible otherwise. Throw distance. Casio specs give a projection range from 50" diagonal with the front of projector about 2" from the screen to 110" at about 1'-6". The minimum 50" is defined by how close the projector can be to the screen without interfering with airflow through the intake vents on the front. The maximum is defined by the lensing system. The test unit was able to focus well at 110", but not at 115". On-board audio. The 16-watt mono speaker delivers good audio quality at high enough volume for a small to mid-size room. Fan noise. The XJ-UT311WN's fan noise is a constant, medium frequency pitch in all power modes, but it varies drastically in volume. It drops noticeably at each step from Bright, to Normal, to Light Control On at level 7, to each level down to 1. At each step, fewer people are likely to find it distracting, and few if any will consider it bothersome at level 5 and below. Casio recommends using High Altitude mode at 5,000 feet or above. At level 5, it has little effect on volume, but raises pitch just a bit. At brighter settings, the higher volume is a bit more noticeable, and it adds a slight buzzing overtone. If you have to use High Altitude mode, you'll probably want to stay with level 5 or below. Lens offset and mounting. The lens offset will work well with the XJ-UT311WN either on a flat surface below the screen or in a wall mount above it. With the projector sitting on a table, the center of the image is 70% of the image height above the center of the lens, with the bottom of the image 20% of the image height above the lens centerline. If the mount isn't positioned perfectly, so you have to tilt or swivel the projector to point at the screen, you can adjust both vertical and horizontal keystone by +/- 5%. Throw distance. The lensing system has no zoom. To match the image size to the screen, position the projector with the front ranging from about 2" away for a 50" screen to about 1' 6" for a 110" screen. The Casio-XJ-UT311WN Projection Calculator will give you the throw distance range for the image size you want. But keep in mind that the lens is near the back of the projector, so subtract 9" from the throw distance to get the distance between the front of the projector and the screen. 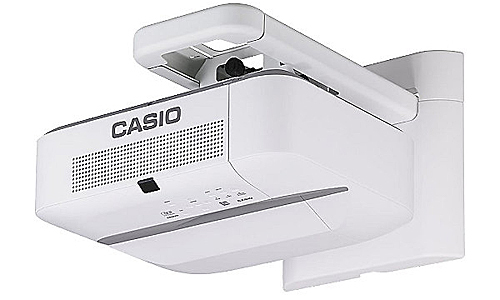 The Casio XJ-UT311WN is aggressively priced, easily bright enough to stand up to ambient light at its maximum image size, and one of the lightest 1280x800 resolution UST projectors available, making it among the easiest to install. 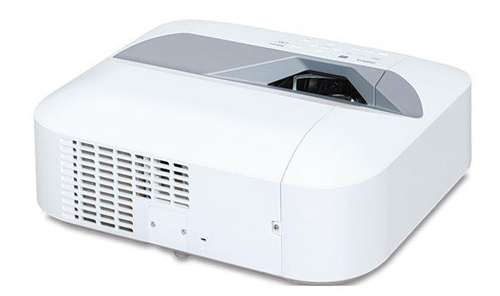 At $1,499 street, it is one of the least expensive current 1280x800 resolution UST projectors on the market with a solid-state light source--Casio's LED-laser hybrid. The test unit lived up to its 3,100 ANSI lumen rating, at a measured 3,125 lumens. More important is that between the Light Control setting, color presets, and six Eco levels, it offers both a tremendous range of brightness, from 3,125 lumens all the way down to 844 lumens, and enough steps to let you set it for any level of ambient light you're likely to use it in. Budget-sensitive education users will particularly appreciate that they can save on electricity by using no more power than they actually need. The brightness range also complements the range in image size nicely. All of the color presets, including the lowest brightness preset at 1370 lumens, are bright enough at full power to stand up to moderate ambient light with a 1.1 gain screen at the maximum 110" diagonal size. And there are lots of settings for stepping brightness up or down for higher and lower ambient light levels. Just as important, even the brightest mode delivers nicely saturated color for presentations, although a slight magenta shift makes colors in photos look oddly unnatural. With Light Control set On, most of the color modes are slightly blue shifted, which most people don't find objectionable and is accurate enough for watching film or video in a classroom or for clips in a presentation. The XJ-UT311WN also earns points for easy setup and low maintenance. At 12.6 pounds, it is one of the lightest UST projectors in its class, which helps make installation easy. Its solid-state light source with a 20,000 lifetime combined with its filter-free design and 24/7 duty cycle makes it nearly maintenance free, which is welcome in any application and makes it a good choice for retail displays and other signage. Its Quick On feature, meaning that it takes only 5 seconds to reach full brightness, and Instant Off, are also highly welcome touches, eliminating any need to wait for the projector to warm up or cool down. The Casio XJ-UT311WN's particular mix of strengths--low price, high brightness, setup ease, little-to-no maintenance, ease of use, and, of course, the ultra short throw--make it a notably solid value. For classrooms and conference rooms, as well as for retail displays and similar 24/7 signage applications, the Casio XJ-UT311WN can do a sterling job of giving you a big, bright image in an impressively small space.